Charles Greene III lives in a house full of magic and wonder. The following interview contains his thoughts and wisdom on collecting magic posters. ephemera: I'm reading The Secret Life of Houdini, and I'm becoming a big fan of this genre of ephemera. It's really a great area of focus for an ephemera collector, I think. What got you into collecting magic posters, Charles? Greene: About 15 years ago, I visited the home a magic poster collector. He had magic poster lithographs on all of his walls. It was the first time that I had seen magic posters framed and on the wall. I was blown away, and hooked for life. I bought my first magic lithograph from him that day. It was a poster of the magician/mindreader Alexander, "The man who knows." ephemera: When it comes to collecting magic, I imagine the competition is fierce for these items. How do you over come the challenges you face as a collector of these items? Greene: The greatest challenge is finding poster lithographs to add to the collection. Since I started collecting, the prices have increased dramatically. People who have posters are less willing to sell them. At auctions, posters which are uncommon seem to go for outlandish sums. My guiding principle is to be patient and try not to overspend on a poster. I've got a house full of posters, so I have the luxury of waiting for a poster to appear at the right price. Recently, I told a major poster collector that I was thinking about spending too much for a poster. I told him that I might not have the opportunity to buy it again. He inquired about my age. He is 30-years my senior. He assured me that I'd see the poster image in the future, and at a better price. His council was to simply wait. I'm working on applying that lesson. ephemera: What are your favorite magic posters? Greene: My favorite posters are ones which show the diversity in magic, are graphically strong, or convey an immediate sense of magic through the art. 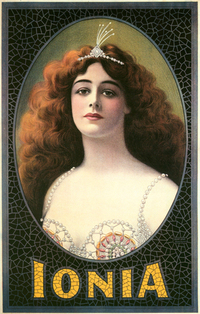 I have posters of female magicians, Indian magicians, and amazing acts of levitation. ephemera: Yes, these images are among the most compelling I've seen in the world of old paper. What’s your advice for achieving success as a collector? Greene: Be passionate about what you collect. That passion will convey to others and make things happen. Create connections with old collectors, new collectors, gallery owners, auction houses, antique shops. Let everyone know what you are looking for and you'll be more likely to have someone call you when they see it. ephemera: What resources and tools do you recommend for people interested in becoming magic poster collectors? Greene: Most magic poster lithographs are held by magicians. With my travels, I've been fortunate to see most of the major magic poster collections in the world. Having been able to see what is out there has been a great resource for forming my collection. From the published print, I buy all auction house catalogs and gallery notes that apply to magic posters. The Internet has made communications faster, but has made buying posters and finding that hidden deal much harder. Since there is very little written on magic posters, I also seek out books on lithography and posters in general, so that I have a better understanding of how magic posters lithographs fit into the big picture. ephemera: I'm very glad you took the time to share these posters with the ephemera blog, Charles. I really enjoyed seeing them and hearing about your collection. Thank you. You sent over a lot of great examples. I couldn't them all in this post, but I plan to feature them in the near future. 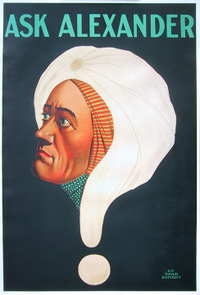 I own A Alexander poster and have been looking to price it out.It measures 6ft10inches by 3ft8inches.It is the Alexander with the question mark turbin.